Every journey we take on the web is unique. Yet looked at together, the questions and topics we search for can tell us a great deal about who we are and what we care about. That’s why today we're announcing the biggest expansion of Google Trends since 2012. 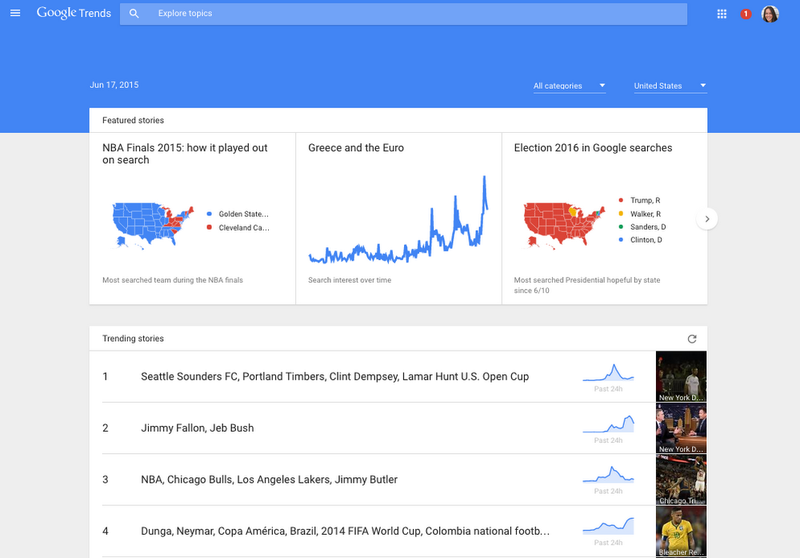 You can now find real-time data on everything from the FIFA scandal to Donald Trump’s presidential campaign kick-off, and get a sense of what stories people are searching for. Many of these changes are based on feedback we’ve collected through conversations with hundreds of journalists and others around the world—so whether you're a reporter, a researcher, or an armchair trend-tracker, the new site gives you a faster, deeper and more comprehensive view of our world through the lens of Google Search. You can now explore minute-by-minute, real-time data behind the more than 100 billion searches that take place on Google every month, getting deeper into the topics you care about. 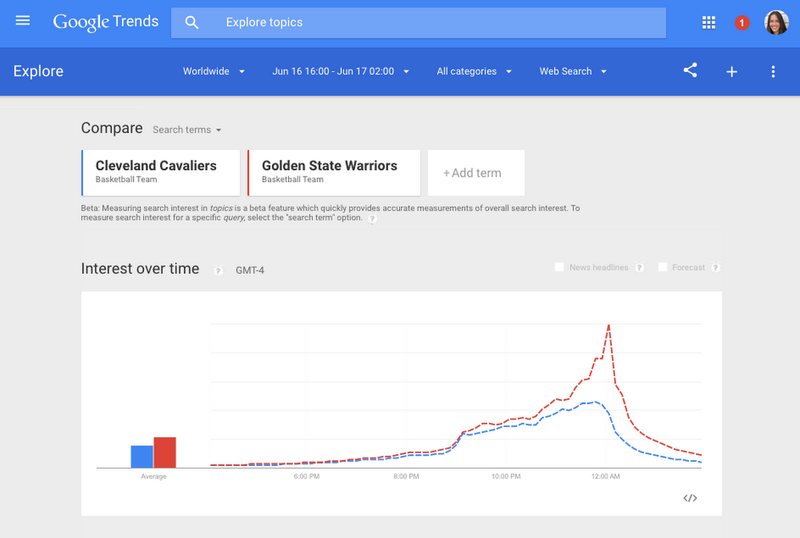 During major events like the Oscars or the NBA Finals, you’ll be able to track the stories most people are searching for and where in the world interest is peaking. Explore this data by selecting any time range in the last week from the date picker. 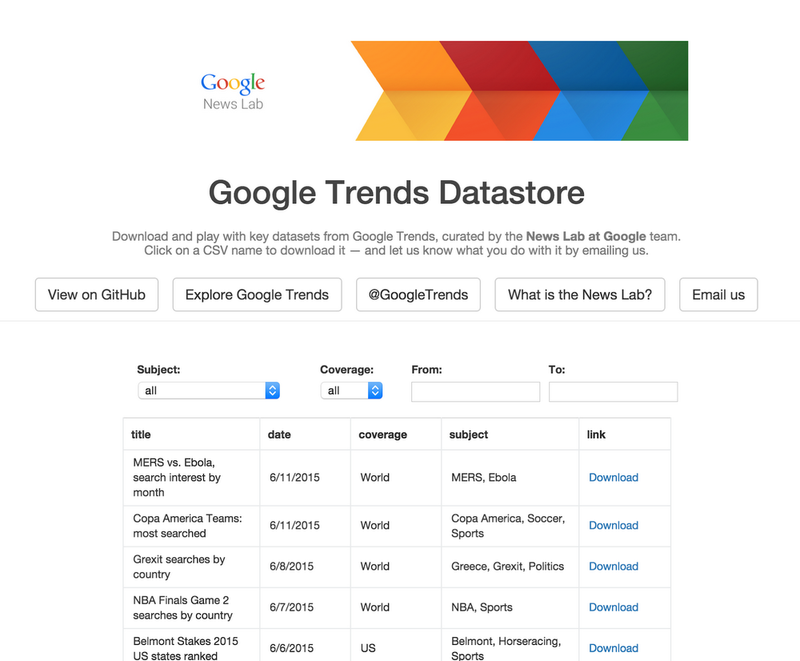 On the new google.com/trends, you’ll find a ranked, real-time list of trending stories that are gaining traction across Google. 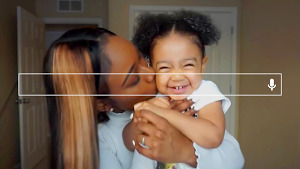 In addition to Search, we now look at trends from YouTube and Google News and combine them to better understand what topics and stories are trending across the web right now. The redesigned homepage is now available in 28 countries around the world, and we’ll continue to add more locations in the coming months. We’ve also increased the breadth and coverage of Google Trends data to allow for in-depth research on more niche topics in smaller geographies. To help you understand the data behind the headlines, our News Lab team examines trending topics every day and finds interesting nuggets of data that bring news stories to life. You can follow us on Twitter to stay up to date. And for data journalists who want to do their own analysis, starting today we'll publish data sets on specific topics to our Github page. The Washington Post launched an interactive data visualization on climate change where viewers can discover the most pressing environmental issues in various cities. The Guardian and Buzzfeed used Trends data to tell the story of the recent U.K. election; Buzzfeed produced a map of most-searched party leader in each constituency, and the Guardian used trends during the campaign to showcase what voters were asking Google about the candidates. HLN integrated Google Trends data into their television programming during LGBT Pride Month to explore when terms like “transgender” became widely used around the world. CNN Politics published monthly updates on search interest and top questions around U.S. Presidential candidates as they announce their candidacy. Without further ado, we’re going to dive into the minute-by-minute search interest around Steph Curry after last night’s Warriors’ win. 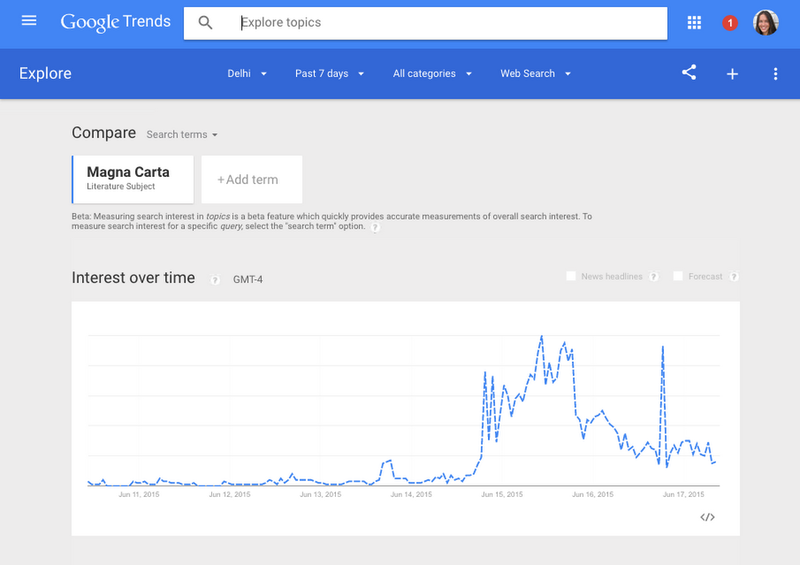 No matter what your interests are, we hope you’ll visit the new Google Trends to explore your favorite topics and better understand the world around us.